Frau und Herr Hoffer sind sehr nett. Die Wohnung ist gemütlich und sauber. Die Wohnung liegt in der Mitte der Salzburgregion von dort kann man leichterweise viele orte erreichen.. Under dem Strich die Wohnung ist preis leistungsverhältnis. Vielen Dank für die lekkere Kuchen. All that being said, for the late time of the booking, for the location and for the service, the price was unbelievable, 65 Euros/night for an apartment which could easily accommodate up to six people. The owners, whom live on the site, on the ground floor apartment are absolutely lovely, friendly, helpful, chatty and not interfering. The house is very close to the motorway , very warm, very quiet. Two nicely sized bedrooms and a third, smaller. The kitchen for some might seem a bit small but for us (4 people) was perfect. The only down side is that the cooker has only two stoves , and not any oven , just a microwave , which can be a little bit difficult if you like cooking at home (like we do) , but, never mind, we have managed to have some delicious meals. We always buy food from the local shops, to be am honest, if you see the color of the yolk from an egg bought there locally...you'll come to know what quality means. We drove to Altenmark im Pongau and Radstadt daily, we spent a day in SALZBURG, and , like every other time , we just hope we'll be able to go there in summer time, Warfen is famous for its ice caves. I will strongly recommend this apartment , there are two for rent, if bigger size parties . Thank you very much Hedwig and thank you to your husband as well. for an baking oven and an ofen with more plates. We are happy, if you like to stay again in our house. Hedwig and Andreas were very friendly and accommodating. Their apartment was very clean and Andreas went as far as drying our ski boots every night. We left early for the airport and both of them saw us off. They left us a Christmas gift on Christmas Day which was an unexpected surprise. 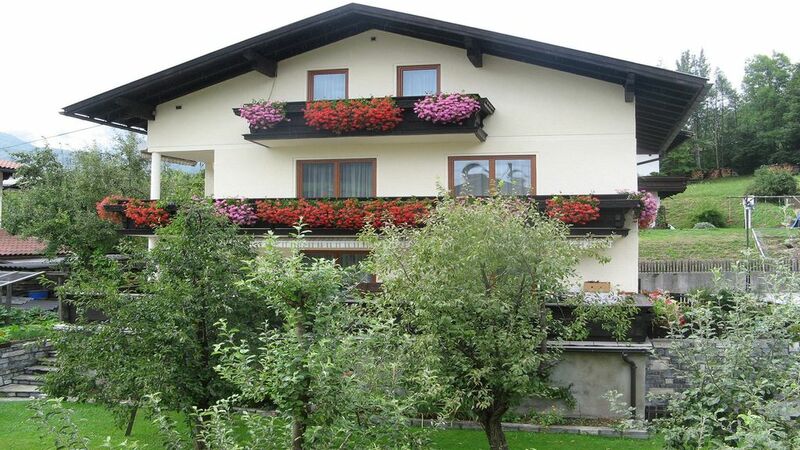 The apartment is approximately 25 mins to a large ski resort, Flachau and 40 minutes to Bad Gastein. There are three restaurants in the town and a grocery store within 5 mins. We were in the apartment on the third floor and has two bathrooms (en suite for two of the three bedrooms; a sink in the third bedroom). There is one toilet in the hall of this particular apartment. There is a small kitchen with everything you need to prepare food if you choose. Very quiet and clean community. We recommend and would stay there again. Thanks to Hedwig and Andreas for being such warm and friendly hosts! Es freut uns, wenn sich unsere Gäste in unserem Apartment wohl fühlen. die Nähe zur Stadt Salzburg ist ein Pluspunkt. Gäste aus vielen Ländern waren gerne hier. "great warm and kind people, great location, great house. all is perfect, can''t find even one con"
"Perfect place for our family, the place was very clean and quiet. Owners are realy very nice people." "The apartment is in very good location, contains all that was promised, clean and very comfortable. The owners were were very helpful, kind and helped in finding local attractions an stores. The scenery from the apartment is beautiful." In the heart of Pongau, located at the foot of the Tennengebirge, we are the ideal starting point for many holiday pleasures. In the summer of swimming fun, cozy alpine walks ranging in high alpine mountains (Tennengebirge, Hochkönig, Hohe Tauern National Park, etc.). A visit to the Ice Giant World, currently the largest explored ice cave in the world, http: // www. floe. at the castle Hohenwerfen with bird of prey flight demonstration, http: // www. Salzburg-castles. at the Liechtensteinklamm (currently closed because of rockslide) or the festival city Salzburg worthwhile. The heated outdoor swimming pool or the surrounding lakes, and a jetboat ride on the Salzach invite in good weather. Also skiing in the summer is possible (Kitzsteinhorn). The Tauern bike path about 100 meters past our house. or Obertauern, a limitless skiing pleasure. Walking in snow, cross-country skiing, a romantic sleigh ride or a toboggan ride is always a pleasure. Our apartment has been awarded by the national association of private room and apartment rental with 3 Edelweiss. Anzahlung / Abschlagszahlung bei der Reservierung. Heizungszuschlag saisonbedingt. Schlüsselübergabe durch den Besitzer. Preise je nach Dauer des Aufenthaltes und Saison. Anschließend die Rücktrittsbedingungen: Rücktritt durch den Vertragspartner – Stornogebühr 5.5 Bis spätestens 3 Monate vor dem vereinbarten Ankunftstag des Gastes kann der Beherbergungsvertrag ohne Entrichtung einer Stornogebühr durch einseitige Erklärung durch den Vertragspartner aufgelöst werden. 5.6 Außerhalb des im § 5.5. festgelegten Zeitraums ist ein Rücktritt durch einseitige Erklärung des Vertragspartners nur unter Entrichtung folgender Stornogebühren möglich: - bis 1 Monat vor dem Ankunftstag 40 % vom gesamten Arrangementpreis; - bis 1 Woche vor dem Ankunftstag 70 % vom gesamten Arrangementpreis; - in der letzten Woche vor dem Ankunftstag 90 % vom gesamten Arrangementpreis.